Usability testing online surveys (and forms). The online questionnaire, be it a survey or form, is truly ubiquitous. The promise of fast data collection from large numbers of users appeals to business, marketing and design stakeholders alike. But not so fast… while large sample data comes with the unspoken assumption that the information collected is more valid than that gleaned through qualitative means, there is no correlation between large samples and absence of bias. When survey bias is not discovered until late or (worse yet!) not at all, faulty data can lead to faulty decisions. How can we make sure that data collected through surveys and forms is accurate? Testing! Specifically, the cognitive interview method of survey testing. This qualitative technique can easily be used as part of think-aloud usability testing. 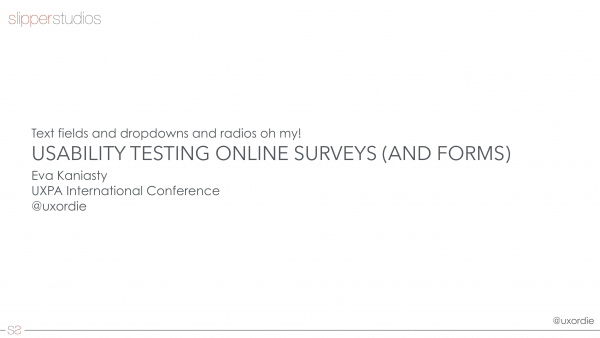 In this presentation, I’ll describe how using this technique can greatly improve the usability of questionnaires, yielding better data.